Drawing is often interpreted as the act of marking any surface with any sign-making material. Obviously, according to this definition it explains that anyone can draw, everyone can draw. If you can write your name, then you can be said as drawing. Now we understand what drawing is, and we all know that some of us can draw better than others. To be more skilled in drawing, requires a few factors. Some of these factors include instruction, time, desire, and more practice. That's why numbones.com decided to collect a list of quick drawing tips so you can immediately see results in your drawing ability as quickly as possible. This list of drawing tips is not a formula that will make you can directly draw more skillfully, but these tips can help you to become more skilled in drawing. These are just a few tips that I took from experience and practice that helped me to draw better. The tips I will share are very easy. Because, tips to be able to draw easily can be done by anyone, whether drawing tips for a kids or a beginner. You can also use these tips to draw anything, whether it's drawing anime, digital drawing, drawing animals, drawing faces, even drawing cartoon characters would be easier. 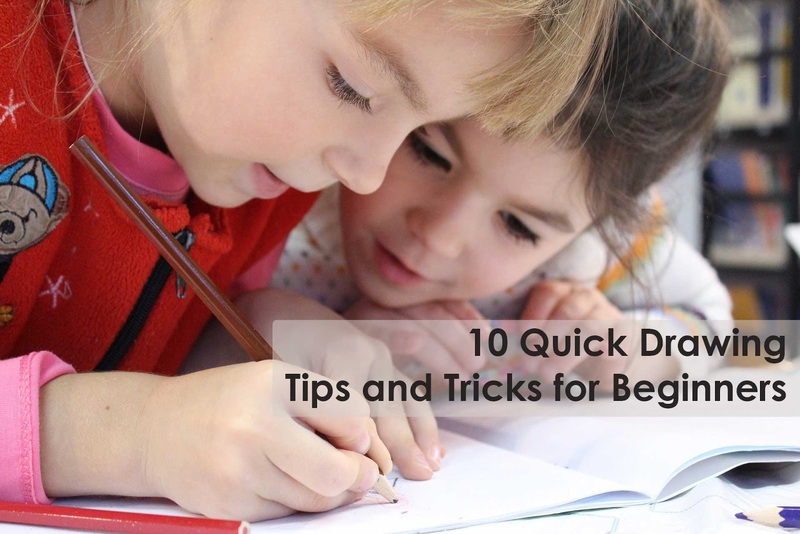 However, the tips I will share are not about steps for easy drawing for kids, easy steps for drawing for beginners, steps for drawing animals, or steps for drawing cartoons. But these tips are more about how you can draw whatever you want with better results. That is to say that drawing is not a magical activity that only a few people have, but all people are born with the ability to be able to draw. Skills are something that can be taught as well as learned. If you want to be able to draw, draw better, or draw like a professional, you can do it, you can be what you dreamed of. Anyone can draw like a professional if they want. Don’t ever say "I can't draw", because drawing can be learned by everyone, especially you. The main trick of Drawing is about seeing. Have you ever taken a photo of something without pointing the camera at the object you want to take? Of course not. But many people think they can draw well without seeing the object that they are going to draw. Which in the end they become disappointed because their draw doesn't look good or doesn't look the same as the original. You have to see the object you are about to draw. In fact, you need to spend a lot of time paying attention to the details of the object you are about to draw. I suggest that the amount of time you have to pay to pay attention to the object must be half the time that needed to complete the drawing. Drawing requires at least 50% of observation. If you want to draw a dog, then look at a dog. Learn the details seriously. Understand what you see, then draw. Everyone knows that to cheat on a test is to look at someone else's paper. Likewise when you draw, pay attention to your object, your answer is there. Just put the answer on your paper. This tips is related to the second tips. Drawing will be easier if you collect photos or better take photos of objects if you cannot draw directly. Some people might underestimate this one tip. But it's also impossible to take all the pictures at once. So, when you can't be in Australia long enough to draw the kangaroo, use one or three photos of kangaroos as resource for drawing. Maybe you already know that everything in this world can be simplified into a basic shapes. When you pay attention to your object, try to find it basic shapes that make up over all shape of the object. By finding these basic shape, this can make you draw more easily. Draw the basic shape first, then draw the contour (outline). And by using these tips, this will help you draw faster. What is meant is the brightness of the object, whether the object is darkness or lightness. So, this value is about light. We cannot see an object without light, so we can see something because of "value". Although color is also an important component in drawing, but this value is not about color. Scale the value and then use it. Before you start drawing, make sure your drawing object has a full range of values, I mean make sure to measure the entire scale of its value. Then you can determine the light source through the use of your values. Tips number #6 is to make sure that you are using the line quality well, which is the line quality is the thickness or thinness of a line. If the object that you are drawing is a picture that contains a line, you must pay attention to the quality of the line. Your line image should look thicker in some areas and thinner in other areas. Applying these tips will add interest and variety to your drawing. Remember to start and finish drawing in the same style. If you start drawing and the movement feels loose and gestural, keep it in that style. And if you start drawing and start feeling tight and precise, keep finish with that style. Make sure that the drawing result will looks like the same artist that drew everything on the surface. Because this will ensure that your drawing looks united and harmonious. Before start to draw, make sure that you understand the right way to use your medium that you are using for your drawing. It's not a problem if you want to do some experiment, but you still have to remember that the most important thing before do some experiment with your drawing medium that is knowing and understanding your limitations with a drawing medium goes a long way. The position when you are drawing does not have to be rigid. It shouldn't even be. For example, when you try to determine the contour of an object, make a few thin lines first. You will have a better chance of finding the right line when you draw a few of them. Just as you will have a better chance of winning the lottery if you buy more tickets than just one. Then try holding the pencil differently from how you hold it when you write. Draw with your shoulder instead of your wrist by moving your entire arm while drawing. And if you are still a beginner in drawing using a pencil, be sure to choose a drawing pencil that is easy to use for beginners. This last tip is the best tips ever. You have to practice more to get more experience. And these tips apply to any skill. Bring your sketchbook anywhere and draw literally everything you see. Try to practice drawing every day. When you have no drawing ideas what you are going to draw, look at the objects around you and imagine how you would draw them. What shapes do you imagine? What value do you imagine? Where does the light source come from? What media will you use? Drawing can even occur between your ears. Research has varied the length of daily drawing practice from 1 hour to 8 hours, and the results show that there is often little benefit from practicing for who spend more than 4 hours per day, and that the actual benefits begin to decline after the 2 hour mark. The key is to monitor the level of concentration that you can maintain. That's the 10 Quick Drawing Tips and Tricks for Beginners, and if you can master all of them, you can become a better artist. Do not break up if the results of your draw still look bad. Because there is no easy way to become a great person. Keep fighting until you can reach the results that you want. And if you fell not clear about the tips that I shared, don't hesitate to ask in the comments section. Thank You. 0 Response to "Best 10 Quick Drawing Tips and Tricks for Beginners"